So far the history of the kumite created by the various schools has not been researched and documented well. Because it is possible to create all kinds of kumite at any given time, the lack of documentation is a problem. It is therefore important to record the kumite-history of various schools. Like probably most of you, during two decades in karate-related martial circles, I have come across literally hundreds upon hundreds of sets of prearranged sparring, or yakusoku kumite. Each style, sometimes even individual dōjō seems to have had their own, each with specific etiquette, peculiarities, and habits, which most of the time were more difficult than the techniques itself. Some of the sets were ingenious, others superficial. I remember complex jūjutsu programs that were – after all – yakusoku kumite. Even Japanese paired kata of jūdō or kendō might be seen as yakusoku kumite. I also learned some kenjutsu, which would also fit into this category. Every time the course of a paired technique is predetermined, it might be called yakusoku kumite. If designed under consideration of the proper concepts and trained under a good teacher, they constitute an important part of practice and may even make for a great performance, which can be seen in this set of kobudō, for instance. As many as there were, as many I forgot. Recently I reviewed some files about the 7 yakusoku kumite of the Matsubayashi-ryū, which I learned and later sublimed under the then head of the school. When I dug it out I wondered when this set of seven was created, and under what conditions. I wanted to find out more details. So I first looked up Nagamine Shōshin’s Japanese book, published in English by Tuttle under the name of The Essence of Okinawan Karate-do. The following is the master’s description. All mistakes in the translation are mine alone. A long time ago kumite 組手 was referred to as “hente” 変手 (Oki. : hindi ヒンディ). The term “kumite” 組手 was probably first documented in written form in the textbook “Karate Kumite 空手組手” by Hanashiro Chōmo Sensei (1869 – 1945), written in August 1905. Kumite is not something separated from kata, quite on the contrary: It means the “applied skills” (ōyō-te 応用手) transformed from the kata. Karate, without using any kinds of implements, is a bujutsu that developed from empty-handed methods of physical conflict. In it all parts of the human body become weapons. On the other hand, the whole body is also the target of the enemy’s attacks. With this being the true meaning of shiai 試合 or bouts, and the dangers it poses, it seems that this would render the practice of kumite rather impossible. However, since karate is a bujutsu, this challenge must inevitably be accepted. If someone would have to exercise his natural, innate right to legitimate self-defense, it is questionable if the practice of kata alone would be sufficient to deal with the situation. It is at this point that kumite becomes necessary. However, unless kumite is thoroughly researched as a fight in real earnest, instead of a competition match of kumite, it will not generate a karate that is truly a bujutsu. Sticking to kata only cannot be called true karate. As I have always said, kata and kumite are like heaven and earth, like the sun and moon, like the front and the back side of things, which are perceived as dualities when in fact they are inseparable. And therefore kata and kumite must be studied complementary to each other. That is, the various techniques interwoven into the kata must not only be practiced theoretically against a ‘virtual enemy in the air’, but specifically as an applied practice against an actual live human being. By way of trial and error, a personal combative experience is accumulated and finally brings about reflexive techniques of offense and defense at will. This is the final goal of karate as a bujutsu. It should be noted that there are three kinds of kumite, namely prearranged sparring (yakusoku kumite 約束組手), armored sparring (bōgu kumite 防具組手), and free sparring (jiyū kumite 自由組手). Next I would like to add a few words about specific points that should be considered when studying kumite. Namely, kumite should be studied based on the recognition of one’s abilities of intellectual, combative, and physical power, and that the enemy also fights under the same combative conditions. This requires special attention. However, looking at the current yakusoku kumite, this obvious matter is ignored by not a few people. For example, as regards the attacks, two actions are being used, one for the parry, the second for the counterattack. But it is also possible to directly counterattack from the parry. Often seen performed with intentional drama, this is an artificially inflated form of yakusoku kumite in which even the decisive techniques (kime-waza 決め技) are done in this two-count way. Seen from a bujutsu point of view, this is dead kumite. Motobu Chōki Sensei, my former teacher to whom I owe much, strictly warned that this kind of dead kumite does not help in developing combative ability whatsoever. Therefore, I devised an original kumite myself, carefully basing it on the following seven indispensable conditions. ● Paragraph 1. To design single thrusts, or kicks, to be performed as techniques that simultaneously serve both the functions of defense and offense. ● Paragraph 2. To design defenses and offenses to be performed as techniques that use both hands simultaneously. ● Paragraph 3. To design defenses and offenses to be performed as techniques that use the hands and feet simultaneously. ● Paragraph 5. To design offenses (attacks) to be performed as techniques with a constant mental preparedness, as if fighting with one’s back to the wall and with no chance for an easy retreat, and so to find means of survival amidst a high stress level, and to close in on the opponent to attack, either in front, or to his side by means of body shifting (tenshin). ● Paragraph 7. To design techniques to be performed so as to always seize the opponent when coming into contact with him, and don’t release him, and reflexively attack him while neutralizing his arms or body. The following seven kumite kata of Matsubayashi-ryū were created by utilizing the above items. On the opponent’s right upper-level thrust (jōdan-zuki 上段突き), take a step back and receive it with an upper-level parry (jōdan-uke 上段受け) with the left forearm. Then attack the unprepared opponent yourself with a right chasing thrust (oi-zuki 追突き). The opponent in jigotai-dachi 自護体立ち receives this with a left sideways sweep and simultaneously releases a fast strike towards your face. Fend this off yourself with an upper-level thrust (jōdan-zuki 上段突き) fend off the opponent’s attack and strike the decisive technique to the vital point on the philtrum (jinchū 人中) on his face. This is an application of preceding paragraph 1. On the opponent’s right middle-level thrust (chūdan-zuki 中段突き) take a step backwards and deflect it with your left forearm from the inside to the outside. The opponent immediately continues with a left and then a right middle-level thrust. Remove his left thrust with your right fist, and while fending off his right fist with your left fist, perform a right sword-hand strike to the opponent’s cervical region as the decisive technique. This is an application of preceding paragraphs 2 and 4. On the opponent’s right chasing thrust (oi-zuki 追突き) into jigotai-dachi, step forward with a right inside parry (uchi-uke 内受). The opponent immediately turns his hips into a right forward-bend stance (zenkutsu-dachi 前屈立ち) and simultaneously releases a left strike to your face. As an application of the tactic of shortening the distance or “attacking the opponent in close proximity with the mental preparedness as if fighting with one’s back to the wall” from the preceding paragraph 5”, plunge towards the opponent’s chest and perform a horizontal elbow-strike (yoko hiji-ate 横肘当て) as the decisive technique to the thoracoabdominal vitals. As shown in the photo, the opponent seizes your shoulder from behind with his right hand. Immediately seize in check his hand on your shoulder and spin around. The opponent releases two continuous thrusts, with the left first to your fest, followed by the right fist to your thoracoabdominal vitals. Remove his attack to the face and simultaneously take advantage of the technique of “performing defense and offense simultaneously with both hands” from the preceding paragraph 2, and perform the decisive technique to the opponent’s vital point solar plexus, or epigastrium (mizoochi 鳩尾). The opponent delivers a right thrust from a left forward-bend stance (zenkutsu). Evade into a slanted forward-bend stance (naname-zenkutsu-dachi 斜前屈立ち) and stop the blow with your right forearm. The opponent immediately follows with a right kick. Transform into a crossed-leg stance (kōsa-dachi) and nimbly sweep it off. You and your opponent both perform one rotation until you face each other again. The opponent at full risk comes forward with a right middle-level thrust into a right forward-bend stance. Seize his arm with your left, and as the decisive technique deliver a kick to the vital point (‘lighting,’ tenkō 電光) at his abdomen in front of the kidneys. This is an application of preceding paragraph 6. To pre-empt your opponent, the drunken arhat posture (sui-rakan 酔羅漢) tempts him to become unwary. Perform the mutual trial for superiority in posture and distance for two or three times. When the opponent attacks with a right thrust (jun-zuki 順突き) in a right forward-bend stance, press it down with a right hand-sword (shutō 手刀), using the tactic of “when coming into contact, seize and not release the opponent, and reflexively perform an attack” from the preceding paragraph 7, seize the opponent’s right fist with your left hand and simultaneously perform Uraken 裏拳 as the decisive technique to the vital point on the philtrum (jinchū 人中) on his face. With his right hand the opponent seizes your lapel at chest level and tries to pull you down to the front (mae-daoshi 前倒し) and to push you over backwards (ushiro-oshi 後押し). Concentrate power in the hips and abdomen, block the opponent’s right hand with your left hand-sword (shutō 手刀) and handle the confrontation like “a willow in the storm”. The opponent, noting he cannot throw your body off balance, with his left fist drives a fast strike against your vital point solar plexus, or epigastrium (mizoochi 鳩尾). Using the tactic of “simultaneously performing defense and offense (attack) with both hands” of preceding paragraph 2, press down the opponent’s attack with your left hand and simultaneously with your right fist perform the decisive technique to the vitals of his face. I understand that someone who never practiced these 7 yakusoku kumite will be at a loss with the description. But it is important as it clearly demonstrates the conditions applied in their creation. Now: when were they created? To my shame I have to admit I missed to ask. But, within my physical archive there is an interesting newspaper article showing the photo below. The photo shows Nagamine Shōshin in the center, and Gushi Jōkei on the left. 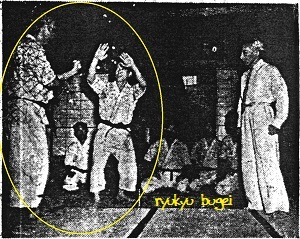 Not only are these the same two persons that posed for the description in Nagamine Sensei’s 1976 book, but this photo also shows them performing the yakusoku kumite No. 6. And this was in 1955, twenty-one years prior to the publication of Nagamine Sensei’s book. In other words: the 7 yakusoku kumite of the Matsubayashi-ryū were established at least in 1955. After I came across this I asked an old time student of Nagamine Shōshin Sensei. She remembered asking Nagamine Sensei about the 7 yakusoku kumite in 1995, when he answered “40 years ago”. At that time of my question, she did not know about the 1955 article. In other words, the date 1955 was confirmed by two independent sources. From the above it can be said that the 7 yakusoku kumite were apparently established by 1955. In this, they probably count among the oldest yakusoku kumite created in Okinawa karate that have been uninterruptedly practiced ever since. We saw that many ingenious concepts were used, some of which – according to the text – were apparently handed down from the predecessors. In other words, these are at least partly tangible concepts of old-style karate. This is also confirmed by the explanation of the old term “hente” 変手 (Oki. : hindi ヒンディ). Furthermore, there are similarities between Nagamine’s 7 yakusoku kumite and the 12 kumite of his venerated former teacher Motobu Chōki. However, they are not a copy. Therefore it might be said that yakusoku kumite is to be understood as the culmination of one’s personal studies and experiences. With this, the benchmark data of Nagamine Shōshin’s 7 yakusoku kumite are established. But there is one more thing to note. Take a look at the photo one more time and pay close attention to the person on the right. The person is non less than Mifune Kyūzō 三船久蔵 (1883 – 1965), 10th dan and considered the greatest technician of the art of jūdō only after the founder, Kanō Jigorō himself. At that day he inspected Okinawa karate, which may serve as a source of great joy and inspiration. According to Shinjo Kiyoshi, a senior student of Nagamine Shoshin, the photo was taken in Tokyo (many thanks to Martin O’Malley, Ireland, for this background info). © 2016 – 2018, Andreas Quast. All rights reserved. This entry was posted in Unknown Ryukyu and tagged Hente, Hindi, Kumite, Motobu Choki, Nagamine Shoshin, Oyo, Yakusoku, ヒンディ, 変手. Bookmark the permalink.